Often in a design project a feature surface is matched with a quiet one to bring out the best in the former. 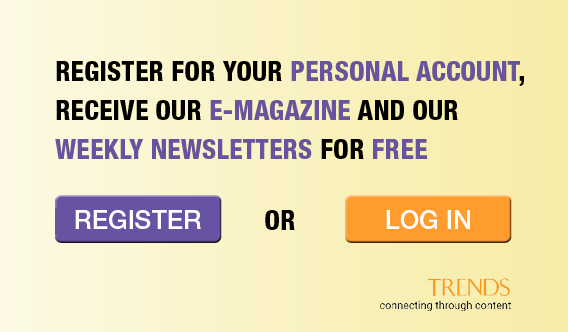 However, a trained eye can bring more than one strong material together for even greater impact. 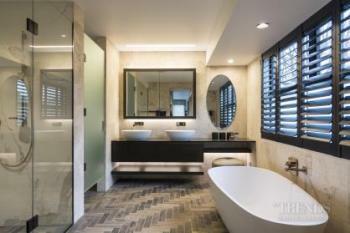 And that was the case with the master ensuite and powder room featured here – two of three bathrooms created for the home by designer Angelique Armstrong. "There are three principal surfaces featured in the master suite," says Armstrong. 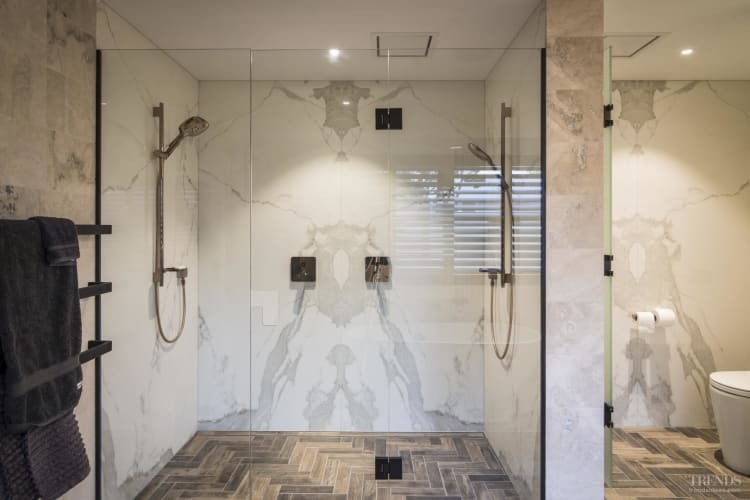 "The walls in the shower and toilet areas are finished in book-matched large format Neolith porcelain sheet to dramatic effect while a herringbone floor runs right through the space. This elegant floor was laid wood tile by individual wood tile – not in sheets – creating a warm, crafted feel." "The other lead surface is the travertine stone tile seen on the balance of the wall surfaces. While all these prominent finishes are eye-catching in their own right, their shared soft tonal qualities mean they work well together." Accentuating the look, the rich Vanilla Noir Caesarstone vanity benchtop provides a dark counterpoint to the pale wall surfaces, as does the dark stained oak vanity itself. The cantilevered nature of the vanity adds to the sense of space in the master ensuite. The negative detail under the benchtop, combined with the floating shelf below the cabinet unit, gives the twin vanity a pulled-apart, modern aesthetic, accentuated by backlighting. The wood frame around the mirror-fronted wall cabinet over the vanity adds a homely feel. "In addition, the top extends beyond the cabinet, creating a makeup desk complete with an oval mirror and a pouf," Armstrong says. "We chose red gold fittings where possible to play off the stone surfaces. However, where elements couldn't be sourced in this finish we went with black detailing – as seen in the heated towel rails and operable shutters above the tub. "Another way we addressed detail harmony was by leaving out the hardware completely – the glass toilet cubicle door has a cut-out handle and the shower door is simply push to open." 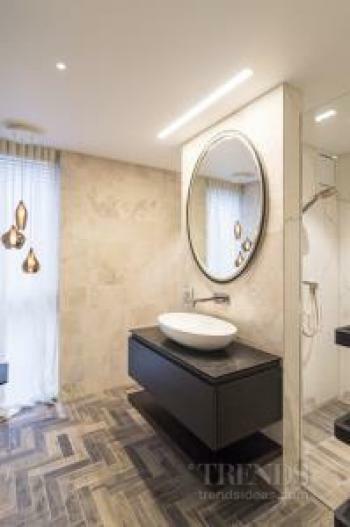 The powder room – together with two other bathrooms in the home – has similar material treatments, including the travertine tile, bookmatched Neolith sheet and herringbone floor. It also has a simpler version of the bathroom vanity, sans makeup space but with the same contemporary deconstructed appeal.